Cap san Augustin arrived at Blohm+Voss on 26 March and completing its class repairs in Dock Elbe 17 on 14 April. The vessel has an overall length of 333m, overall breadth of 48.2m breadth and maximum draught of 14m. Built in 2013 it was the third vessel in a series of nine from Hyundai Heavy Industries yard in Ulsan. The scope of work included hull blasting and repainting, replacement of the propeller blades as well as bow and stern thrusters, replacement of the propeller shaft seal, HFO pre-heater, shorting of the main mast, miscellaneous steel work and tank inspections. Just before the Cal san Augustin arrived at the yard her sister ship the Cap San Nicolas left Blohm+Voss on Friday 23 March, having completed her five year class docking and returning to service with Hamburg-Süd between Europe and South America. Among other things, the vessel transports refrigerated cargo such as meat, fruit and vegetables from the east coast of the continent to Europe and Germany. Work on the Cap san Nicolas , including control measurements, the removal of the propeller shaft to determine and document the degree of erosion and the overhaul of several valves used in a variety of systems. Also on the agenda was the cleaning and repair of various auxiliary drive systems such as the fuel economisers, the lubricating oil pumps, auxiliary coolers, engine room ventilation, seawater cooling pumps and other machinery equipment. In order to meet strict class requirements, the exterior, which is heavily weathered from docking manoeuvres, was checked and repaired where necessary. In addition, the front anchor pockets, from which the 385 meter long anchor chain runs, were reinforced. The hull was blasted and repainted with about 24,000 litres of anti-foul coating. 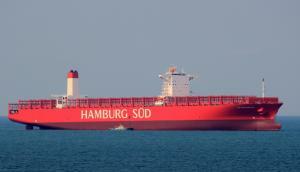 As of December 2017, Hamburg Süd was final acquired by A.P. Moller - Maersk. For the time being Hamburg Süd will remain a commercially independent company with its own brand. Maersk Line and Hamburg Süd will have a total container capacity of 4.15 million TEU and a 19.3% share of the global container fleet capacity.